Brunsell Lumber & Millwork truly is your one-stop resource. In addition to providing the materials you need, we are specialists in contractor tool sales and service. We’ll show you how to use a tool before you buy it. We’ll answer your questions when you’re on the job. We have a large pneumatic hose and fitting selection. 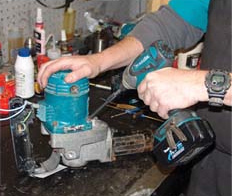 In addition, we offer saw blade, hand saw, drill and router bit sharpening.